Plasma cells (PCs), the terminal effectors of humoral immunity, are short-lived unless supported by niche environments in which they may persist for years. No model system has linked B cell activation with niche function to allow the in vitro generation of long-lived PCs. Thus, the full trajectory of B cell terminal differentiation has yet to be investigated in vitro. In this article, we describe a robust model for the generation of polyclonal long-lived human PCs from peripheral blood B cells. After a proliferative plasmablast phase, PCs persist in the absence of cell division, with viability limited only by elective culture termination. Conservative predictions for PC life expectancy are 300 d, but with the potential for significantly longer life spans for some cells. These long-lived PCs are preferentially derived from memory B cells, and acquire a CD138high phenotype analogous to that of human bone marrow PCs. Analysis of gene expression across the system defines clusters of genes with related dynamics and linked functional characteristics. Importantly, genes in these differentiation clusters demonstrate a similar overall pattern of expression for in vitro and ex vivo PCs. In vitro PCs are fully reprogrammed to a secretory state and are adapted to their secretory load, maintaining IgG secretion of 120 pg/cell/day in the absence of XBP1 mRNA splicing. By establishing a set of conditions sufficient to allow the development and persistence of mature human PCs in vitro, to our knowledge, we provide the first platform with which to sequentially explore and manipulate each stage of human PC differentiation. Plasma cells (PCs), critical effectors of humoral immunity (1–4) and drivers of disease (5), emerge as a subpopulation derived from a wave of short-lived Ab-secreting cells (ASCs) (6–9). In vivo, the life span of these ASCs is a few days, whereas the life span of the longest lived human PCs is predicted to be several years or even decades (2, 3, 10, 11). However, direct evidence for the extended longevity of human PCs is currently lacking (1). A short ASC life span is directly related to the stress of Ab secretion (12–14), whereas the number of PCs maintained in the long-lived pool is constrained by the availability of niches providing survival signals (1, 2, 4). Longevity of established PCs may be restricted by competition for niche space, and in this competitive model, PC intrinsic features contribute to determine life span by controlling migration, homing, and niche affinity (1, 6, 7). During PC differentiation, acquisition of secretory capacity accompanies the initial loss of B cell phenotype in dividing populations of ASCs that have a short half-life (2, 15, 16). Although the transition between such plasmablasts and PCs is associated with changes in both surface phenotype and gene expression (16, 17), the simplest definition of this transition relies on the concept of cell-cycle exit, stating that PCs are ASCs that are nondividing (2). Indeed, compromise in the ability to exit cell cycle has profound effects on the generation of mature PCs (18). Although in vitro generation of ASCs is a long-established technique, the major hurdle in the study of human PCs has been the lack of any in vitro system to generate and maintain mature long-lived PCs. Many variations for in vitro ASC generation have been described, but in most cases, the differentiating cells fail to acquire cardinal markers of mature PCs and remain at the plasmablast stage (19–25). Even where phenotypic maturation of in vitro–generated ASCs has been reported, the phenotypes are incomplete, or PC survival is short and variable with no indication of an extended life span (20, 24, 25). 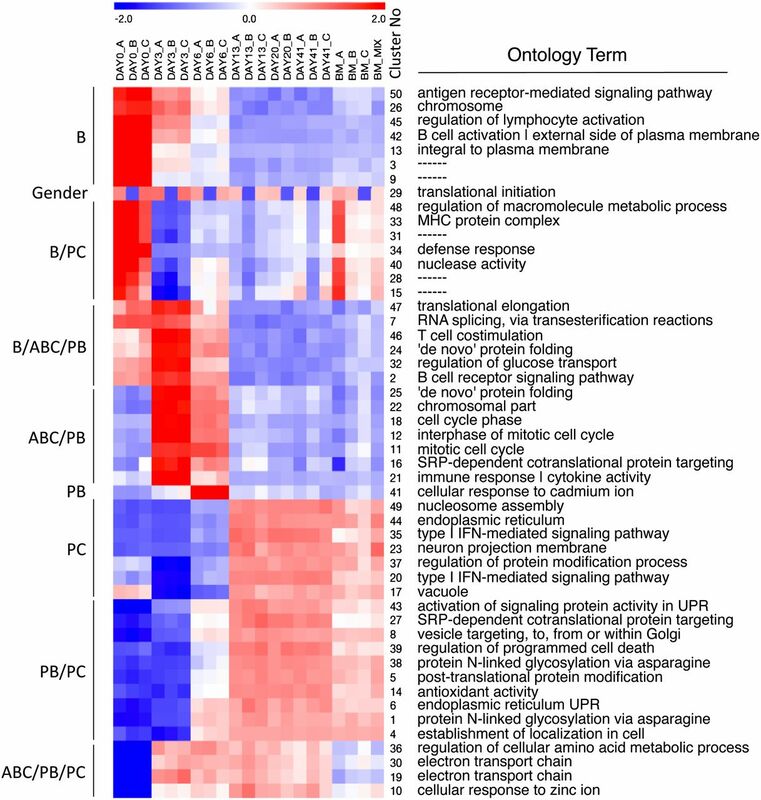 Thus, the inability to generate long-lived PCs in vitro presents both a technical challenge to studies of normal and neoplastic PC biology, and raises an important question: Are in vitro–generated ASCs intrinsically programmed only for short life span, and thus do not include cells equivalent to the precursors of normal long-lived PCs and their neoplastic counterparts? Our results demonstrate that in vitro–generated plasmablasts can mature into functional long-lived PCs in vitro. Long-lived in vitro PCs are adapted to their secretory load, are preferentially derived from memory B cells, and share a common core pattern of gene expression with bone marrow PCs. Reagents include human IL-2 (Roche); IL-6 and IFN-α (Sigma); IL-21 (PeproTech); goat anti-human F(ab′)2 fragments (anti-IgM and -IgG; Jackson Immunoresearch); HybridoMax hybridoma growth supplement (Gentaur); Lipid Mixture 1, chemically defined (200X) and MEM Amino Acids Solution (50X; Sigma); and CFSE, Hoechst 33342, and CountBright beads (Invitrogen). Ten healthy adult donors were used. Six independent donors were used in long-term cultures to day 50 and beyond, results for four of these with assessments at identical time points are shown, but all donors generated viable PCs beyond day 50. Peripheral blood was obtained from healthy donors after informed consent. Mononuclear cells were isolated by Lymphoprep (Axis Shield) density gradient centrifugation. Total B cells were isolated by negative selection with the memory B cell isolation kit (Miltenyi Biotec). Bone marrow aspirates were from 13 anonymous donors and were derived from surplus clinical samples, assessed as normal by clinical flow cytometry. RBCs were lysed (ammonium chloride 8.6 g/L) before flow cytometric analysis or flow sorting. Twenty-four–well flat-bottom culture plates (Corning) and IMDM supplemented with Glutamax and 10% heat-inactivated FBS (HIFBS; Invitrogen) were used unless otherwise specified. B cells were cultured at 2.5 × 105/ml with IL-2 (20 U/ml), IL-21 (50 ng/ml), F(ab′)2 goat anti-human IgM and IgG (10 μg/ml) on gamma-irradiated CD40L-expressing L cells (6.25 × 104/well). At day 3, cells were detached from the CD40L L cell layer and reseeded at 1 × 105/ml in media supplemented with IL-2 (20 U/ml), IL-21 (50 ng/ml), HybridoMax hybridoma growth supplement (11 μl/ml), Lipid Mixture 1, chemically defined and MEM amino acids solution (both at 1× final concentration). At day 6, cells were reseeded at 2.5–5 × 105/ml in media supplemented with IL-6 (10 ng/ml), IL-21 (50 ng/ml), IFN-α (100 U/ml), HybridoMax hybridoma growth supplement (11 μl/ml), Lipid Mixture 1, chemically defined and MEM amino acid solution on gamma-irradiated M2-10B4 cells (4.16 × 104/well). For transwell experiments, day 6 plasmablasts were seeded into the upper chamber of a 24-well plate transwell (clear polyester membrane, 0.4-μm pore; Corning) with the cytokines and media conditions described earlier. The lower chamber was left unseeded or seeded with gamma-irradiated M2-10B4 cells (4.16 × 104/well). Plasmablasts were also seeded in parallel in direct contact with M2-10B4 as described earlier. For extended life-span maintenance, day 6 cells were harvested and recultured, either at 1.5 × 105 cells/well (total volume 1.5 ml) or at 3 × 105 cells/well (total volume 2.1 ml), in the upper compartment of a 24- or a 12-well plate transwell (clear polyester membrane, 0.4-μm pore; Corning), respectively. gamma-Irradiated M2-10B4 stromal cells were seeded into the lower chamber at 4.16 × 104/well or at 8.32 × 104/well, proportionally. Cells were grown in IMDM supplemented with IL-6 (10 ng/ml), IL-21 (50 ng/ml), IFN-α (100 U/ml), HybridoMax hybridoma growth supplement (11 μl/ml), Lipid Mixture 1, chemically defined and MEM amino acids solution. IL-21 was discontinued after day 13. Every 3.5 d, a half (24-well) or a third (12-well) of the media volume was exchanged. A detailed protocol is available on request. Cells were analyzed using four- to six-color direct immunofluorescence staining on a BD LSR II flow cytometer (BD Biosciences). Abs used were CD19 PE (LT19), CD27 PE (M-T271), and CD138 allophycocyanin (B-B4; Miltenyi Biotec); CD19 PerCP (SJ25C1), CD23 allophycocyanin (M-L233), CD38 PE-Cy7 (HB7), CD32b FITC (3D3), and HLA-DR FITC (G46-6; BD Biosciences); CD30 FITC (81337; R&D Systems); CD20 efluor V450 (2H7; eBioscience); CD40 FITC (5C3) and Ig Lambda FITC (1-155-2; Becton Dickinson); and Ig Kappa Pacific blue (A8B5; Exbio). Controls were isotype-matched mouse mAbs. Dead cells were excluded by costaining with Annexin V FITC and 7-AAD (BD Biosciences). Absolute cell counts were performed with CountBright beads (Invitrogen). Cell populations were gated on FSC and SSC profiles for viable cells determined independently in preliminary and parallel experiments. Analysis was performed with BD FACSDiva Software 5.0 (BD Biosciences) and FlowJo. Cells were sorted with a MoFlo high-speed cell sorter (Beckman Coulter) on cells stained with CD138 and 7-AAD at indicated time points. Day 62 PCs were subject to cytospin and Giemsa staining according to standard procedures. Images were acquired on a Nikon Eclipse 80i microscope with 100× Plan Apo oil immersion objective, DS-2M camera, and DS-L2 controller. Cell division was assessed as described previously (26). Cells were washed and resuspended in PBS containing 5% HIFBS. CFSE dissolved in DMSO was added at a final concentration of 10 μM. Cells were mixed and incubated at room temperature for 5 min. Labeled cells were washed twice with PBS containing 5% HIFBS and resuspended in culture medium as required. Cell-cycle analysis was evaluated by Hoechst 33342 (Invitrogen) DNA staining. Cells were harvested at different time points, washed in HBSS, resuspended in HBSS containing Hoechst 33342 at the final concentration of 5 μg/ml, and incubated for 2 h in a CO2 incubator before proceeding with conventional immunophenotyping. Ig H chain V (IGHV) regions were amplified from cDNA with proofreading Phusion Flash polymerase (Finnzymes) using modified BIOMED-2 primers for framework 1 and common JH (27), with an incorporated 5′ M13 sequence (primer sequences available on request). Purified amplicons generated by first-round PCR were amplified with a unique MID-tagged, M13-containing 454 amplicon sequencing primer. Libraries were quantified with Quant-iT pico-green (Biorad), mixed, and sequenced using the standard Roche 454 GSJunior sequencing protocol. Resultant processed, split, trimmed data were analyzed using IMGT HighV-Quest software (28). Ig levels were quantified with the human IgM and IgG ELISA quantitation kit (Bethyl Laboratories) according to manufacturer’s instructions, using a Berthold 96-well plate reader. Ig concentrations were calculated from standard curves. Centrifuged and filtered (0.2 μm) supernatants and media were analyzed by Bioproximity (http://www.bioproximity.com/) following standard protocols. Trypsin digested samples were fractionated using strong anion exchange chromatography. Liquid chromatography tandem mass spectrometry was performed on a Thermo Easy Nano LC II system linked to a LTQ Velos mass spectrometer (Thermo Fisher). RAW data files converted to Mascot Generic Format were searched against Ensembl sequence libraries release 47 (human, mouse, and cow) and cRAP. Proteins were required to have one or more unique peptides with peptide E value ≤ 0.01 from X! !Tandem or Open Mass Spectrometry Search Algorithm, E value ≤ 0.001 and θ ≥ 0.5 for X!Hunter searches, and protein E value ≤ 0.0001 from X! !Tandem and X!Hunter. RNA was extracted with TRIzol and reverse transcribed using Superscript II Reverse Transcriptase (Invitrogen). PCR for X-box binding protein 1 mRNA (XBP1) splicing was performed as previously described (29). Gene expression results were validated with Taqman Assays for PRDM1(Hs01068508_m1), BMI1(Hs00995519_g1), MCL-1(Hs01050896_m1), BCL2(Hs00608023_m1), and PPP6C(Hs00254827_m1) according to manufacturer’s instructions. RNAs were amplified using Illumina TotalPrepTM-96 RNA Amplification Kit (Life Technologies). Resultant cRNAs were hybridized onto HumanHT-12 v4 Expression BeadChips (Illumina) according to manufacturer’s instructions, scanned with the Illumina BeadScanner, and initial data processing carried out using the Illumina GenomeStudio Gene Expression Module (Gene Expression Omnibus: GSE41208; http://www.ncbi.nlm.nih.gov/geo/query/acc.cgi?acc=GSE41208). Final-report files were reannotated using HUGO Gene Nomenclature Committee annotations (2012/08/16 version). Reannotated data were processed using Lumi (30). Probes not detected on three or more arrays were removed and the remaining data quantile normalized (n = 21,339 probes). A linear model was fitted using R Limma (31). Differentially expressed genes between time points were gauged using the Limma empirical Bayes module, with Benjamini and Hochberg correction. The 15% most variable probes (n = 3200) were used as input to the adegenet R package, using k-means clustering with 6 principal components and k = 50 clusters (32). Cluster stability was calculated using adegenet Discriminant Analysis of Principal Components method. Expression values for each of the clusters were plotted using ggplot2 (33). Heat maps were generated with MultiExperiment Viewer using hierarchical clustering (Pearson correlation, full linkage) of median expression values per sample per cluster (34). The Cytoscape Bingo plugin was used with gene ontology (GO) annotations version 2012/08/21, with reference set to genes on the HumanHT-12 v4 Expression Beadchip (35). Nonlinear regression was carried out using GraphPad Prism V5.04. Potential models (linear regression, segmental linear regression, single/multiple-phase decay) were compared using corrected Akaike’s information criterion with the best model (Y = A*XB; B, the scaling exponent, is a constant constrained by optimization among all donors, and A is a constant fit for each donor) having an Akaike’s information criterion difference of between −42 and −59 when compared across models. Approval for this study was provided by U.K. National Research Ethics Service via the Leeds East Research Ethics Committee (approval reference: 07/Q1206/47). In vivo T-dependent B cell activation is linked to the development of long-lived PCs, and IL-21 is involved in the decision to adopt a PC fate (1, 2). We therefore based our studies on plasmablasts generated using a combination of CD40L, IL-21, and IL-2 (21, 36). We modified conditions for optimal cell number and viability including F(ab′)2 anti-IgG/IgM to stimulate the B cell receptor and supplementing media. We observed the expected transition from B cell to plasmablast phenotype by day 6 of culture (data not shown). The cells showed minimal acquisition of CD138 expression, which is the cardinal surface marker associated with the more mature PC stage (17, 37). Next, the plasmablast population was driven toward a mature PC phenotype. We evaluated the ability of a number of cytokines to support PC maturation to day 13 because this falls into the expected survival time of a short-lived PC. We found that the inclusion of IL-6 and IFN-α promoted acquisition of CD138 expression, consistent with published data (20). Furthermore, inclusion of IL-21 up to day 13 increased the size of this population (Fig. 1A, 1B). Generation of a PC population in vitro. (A) Plasmablasts at day 6 were cultured for 7 d in the presence of IL-6 and IFN-α alone (left panel), or with the addition of IL-21 (right panel). Shown are representative flow cytometry plots of CD38 and CD138 expression gated on viable cells using 7-AAD and Annexin V. (B) Total cell numbers (from A) were determined by flow cytometry using CountBright beads. CD138+ cell numbers were derived using percentages as shown in (A). Results for individual donors are identified with symbols. Significances shown were derived from a paired two-tailed t test. (C) Plasmablasts at day 6 were cultured for 7 d in the presence of IL-6, IFN-α, and IL-21 in the absence (left panel) or presence (right panel) of the stromal cell line M2-10B4. Shown are representative flow cytometry plots of CD38 and CD138 expression gated on viable cells using 7-AAD and Annexin V. (D) Total (left panel) and CD138+ (right panel) cell numbers generated under conditions described in (C). Numbers in the absence or presence of stroma are shown on the left and right of each panel. Results for individual donors are identified with symbols. Significance shown was derived from a paired two-tailed t test. (E) Representative example of maturing PCs at day 20 generated in the presence of stromal support; CD38 and CD138 expression (right panel) are shown on CD19+ 7-AAD–excluding cells (left panel). Results are representative of data from three independent donors. Given the importance of the stromal niche in PC survival in vivo (1, 22), the impact of stromal support was investigated. Because hemopoietic stem cells and PCs occupy related niches (38), we used M2-10B4 cells, which support long-term culture of human bone marrow stem cells (39). Inclusion of this stromal layer significantly enhanced the population of maturing PCs recovered at day 13, leading to a consistent 2- to 3-fold increase in CD138+ cells (Fig. 1C, 1D). Stromal cells supported survival rather than differentiation because populations showed similar proportions and levels of CD138 expression at day 13. Under these conditions, the PC population remained viable to day 20 (Fig. 1E). During this differentiation, surface Ags followed expected patterns of expression (Fig. 2). Reduced CD20, loss of CD27, enhanced CD38 and HLA-DR, and acquisition of CD30 distinguished the activated B cell/preplasmablast stage (40); absence of CD20, loss of CD30, strong expression of CD27, increased CD38, and absence of CD138 distinguished the plasmablast stage. Expression of CD138 observed at day 10 correlated with enhanced CD38 and further loss of HLA-DR. Peak CD32b, CD38, CD138, and absence of HLA-DR characterized day 20 PCs. CD19 expression increased, then declined, and was maintained at lower levels on plasmablasts and PCs (Fig. 3C, Supplemental Fig. 1). Phenotypic maturation of differentiating B cell cultures. Representative example of the phenotypic changes observed across the culture from days 0 to 20. Histograms for expression of each Ag are shown as indicated at the top of the figure with the point of peak expression (mean fluorescence intensity) shown in black. Results are representative of experiments with three independent donors. PCs persist in the absence of cell proliferation. (A) Plasmablasts loaded with CFSE at day 6 were assessed at days 10, 13, and 20. (Left panels) CFSE staining; (right panels) expression of CD138 in the CFSE-stained population. (Left panels) Unstained cells are shown in pale gray, baseline CFSE loading at day 6 is shown in black, and populations at days 10, 13, and 20 are shown as dark gray histograms. (Right panel) Day 6 isotype control is shown in pale gray with the staining at day 6 for CD138 in black, and staining at days 10, 13, and 20 shown in dark gray. (B) Maturing PCs were loaded with CFSE at day 13 and analyzed at day 20. Populations are shown as described in (A). CD138 staining is shown for day 13 and 20 populations with isotype control for day 13 in pale gray, CD138 staining at day 13 in black, and day 20 in dark gray. (C) DNA content and phenotype were simultaneously determined with Hoechst and appropriate Ab combinations in maturing plasmablasts from day 6. Hoechst staining is shown (left panels) at the days indicated on the right of the figure. G0/G1 gates are represented with the relevant percentages. The expression of CD19 and CD38 on the Hoechst-stained population is shown on the right. Results are representative of experiments from two independent donors. (D) Histograms showing expression of CD40 (left panel) monitored at key time points with the point of peak expression (mean fluorescence intensity) shown in black. Day 20 PCs were loaded with CFSE and stimulated for 24 h in direct contact with CD40L L cells (right panel). Results are representative of experiments from two independent donors. (E) At day 10, total cells were sorted into CD138+ and CD138−, and both fractions were stained with CFSE. Proliferation was then assessed at days 13 and 20, and correlated with CD138 expression. Results are representative of experiments from three independent donors. Cell division and commitment to Ab secretion are linked (15), and the simplest distinction between plasmablasts and PCs postulates that the former remain in cell cycle, whereas the latter do not (2). We therefore asked whether phenotypic maturation of plasmablasts to PCs in this system was accompanied by additional rounds of proliferation, before cessation of cell division. After activation, B cells underwent up to four divisions in the first 3 d. Under conditions optimized for largest cell number, the degree of cell division at day 6 resulted in CFSE dilution to the limit of the assay range (data not shown). To track divisions in maturing plasmablasts, we loaded day 6 cells with CFSE. The majority of CD138+ cells at day 10 showed significant CFSE dilution relative to day 6. However, there was no further CFSE dilution across the population between days 13 and 20 (Fig. 3A). Cells loaded with CFSE at day 13 were followed to day 20 to confirm this observation. The population remained as a single peak without separation into subpopulations (Fig. 3B). The overall degree of decay in 7 d was equivalent to that in nondividing lymphocyte populations (41). To further confirm this observation, we assessed cell-cycle status (Fig. 3C). Although 20% of the plasmablasts were in G2/M phase at day 6, this decreased rapidly over the next week. By day 10, the G0/G1 fraction constituted 93.9% of the total population, reaching 98% by day 13 and remaining constant up to day 20. Thus, cell division accompanies maturation of plasmablasts to PCs, but PCs persist in the absence of additional cell division. To exclude the possibility of fast cycling PC precursors because of residual impact of CD40 or BCR-dependent signaling, we assessed PC cultures for expression of surface Ig and CD40, and for proliferative responses to stimuli of CD40 or BCR. Surface L chain staining was lost by day 6 of culture (data not shown); in contrast, CD40 expression was downregulated at day 6, but re-expressed on PCs (Fig. 3D). This is consistent with the known expression of CD40 on human bone marrow PCs (42). The total differentiating populations at day 20 of culture were loaded with CFSE and showed no proliferative response after exposure to agonists of BCR or CD40 (Fig. 3D and data not shown). Thus, the population at day 20 is refractory to stimuli, which at earlier phases of the differentiation promote rapid proliferation. To address whether the culture conditions are supporting both PC survival and maturation, we sorted differentiating cells at day 10 into CD138+ and CD138− fractions. Each was independently loaded with CFSE and maintained to day 20 (Fig. 3E). In both populations, CFSE was maintained as a single peak with no evidence of subdivision, thus further excluding proliferation as a mechanism for PC maintenance. Notably, cells that expressed CD138 at day 10 generated CD138high cells at day 20, whereas CD138neg/low cells at day 10 showed 5-fold lower mean fluorescence intensity of CD138 at day 20. Thus, the culture conditions promote PC survival without proliferation, there is a variable rate of CD138 acquisition in the differentiating population, and the intensity of CD138 expression correlates with the preceding duration of expression. Because contact-dependent and -independent mechanisms support PC survival in vivo, we asked whether the stromal support was contact dependent in this system. Plasmablasts were transferred into upper chambers of transwells either in the absence or the presence of stromal cells in the lower chamber. The stromal support of PCs was contact independent, as 2- to 3-fold more PCs were obtained from the upper chamber, when the stromal cells were maintained in the lower chamber (Fig. 4A). 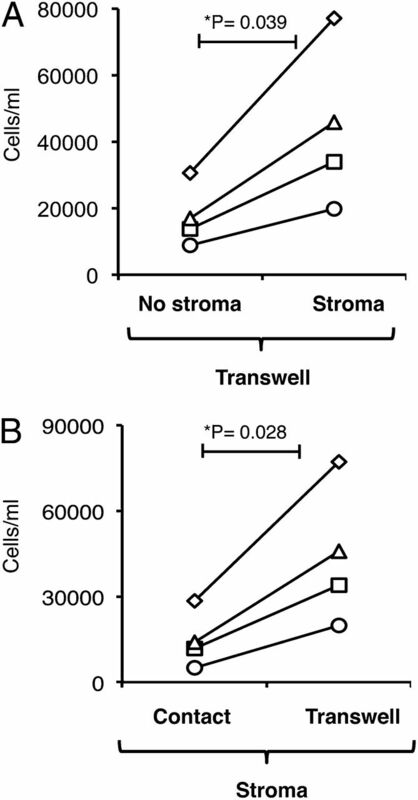 Indeed, absolute PC numbers recovered from transwell cultures with stromal cells were greater than those observed in direct contact cultures (Fig. 4B). The stromal effect is contact independent. (A) Day 6 plasmablasts were cultured in standard media and cytokine conditions in the upper chamber of a transwell plate either in the absence (left) or presence (right) of an M2-10B4 stromal layer in the lower chamber. Shown are the CD19+ cell numbers recovered from each condition at day 13 for four independent donors; the significance is shown (paired two-tailed t test). (B) Day 6 plasmablasts were cultured either in direct contact (left) or in a transwell system with M2-10B4 stromal layer (right) as described for (A). Shown are the CD19+ cell numbers recovered from each condition at day 13 for four independent donors; the significance is shown (paired two-tailed t test). To provide an initial assessment of the M2-10B4 secretome, we subjected supernatant fractions from PC cultures and samples of complete feeding media to shotgun mass spectrometry. All proteins identified in feeding media were ignored. Of the remainder, 44 proteins were identified as murine, and thus M2-10B4 derived; 17 of these were associated with the Uniprot keyword “secreted.” These were filtered for proteins identified by two or more peptides in any sample (data not shown). The remaining 14 murine secreted proteins were AHSG, APOA1, CFH, CSF1, CST3, ECM1, GPLD1, LGALS1, LGALS3BP, PSAP, QSOX1, SPARC, SPP1, and TLL1. Although this represents only the more abundant secreted proteins that are detectable within mixed supernatants, the results demonstrate that the M2-10B4 secretome includes proteins appropriate for a bone/bone marrow environment (AHSG/ECM1/SPARC/SPP1). We next modified the transwell cultures to include a regular 50% media exchange to extend the culture duration. Under these conditions, mature PCs persisted as a viable population to the point of elective culture termination at day 62 in all donors (Fig. 5A, Supplemental Fig. 1). At day 62, the PCs were morphologically viable and displayed features of mature PCs (Fig. 5B). Total cell numbers decayed slowly across the extended culture interval, tending to a plateau phase (Fig. 5C). CD38+ CD138− cells effectively reached zero between days 34 and 48, and CD138high PCs remained as the sole viable population. Long-term PC viability is accompanied by gradual phenotypic maturation. (A) Day 6 plasmablasts were maintained in the upper chamber of transwells with a stromal layer in the lower compartment. Cells were fed at 3.5-d intervals and assessed by flow cytometry at the indicated days. Shown are results from two donors with staining for CD38 and CD138 on viable cells gated using Annexin V and 7-AAD. Flow cytometer conditions were adjusted relative to short-term (20 d) cultures to capture the strong expression of CD138. Results are representative of differentiations from four independent donors. (B) PCs at day 62 were subject to cytospin and Giemsa staining; representative cells are shown (×100 oil objective). (C) Cell numbers were flow cytometrically determined using CountBright beads. Shown are data for total (top panel), CD38+ CD138− (middle panel), and CD38+ CD138+ cells (lower panel), based on percentages assessed using quadrants shown in (A). (D) Representative CD38 and CD138 staining on in vitro–generated PCs at days 20 and 62, from another donor, with equivalent gates for CD38 and CD138 expression on CD19+ cells in a normal bone marrow aspirate, analyzed on the same cytometer with the same staining and settings. PCs retaining a CD19low phenotype showed a gradual increase in CD138 expression over time (Fig. 5A, Supplemental Fig. 1). A defining feature of normal human bone marrow PCs, which includes the long-lived PC population, is very strong expression of CD138 (37). Indeed, from day 34 onward, equivalent levels of CD38 and CD138 expression were observed on in vitro–generated PCs to those observed on bone marrow PCs (Fig. 5A, 5D). To assess potential PC life expectancy and life span, we established the best mathematical curve fit to the population data. Data from individual donors were most accurately fitted by a power-law function (R2 = 0.895–0.957) and indicated the potential for extended PC longevity (>5 y). Despite variation between individuals, the power-law function retained reasonable accuracy in fitting averaged data (R2 = 0.705–0.815; Supplemental Fig. 1C, 1D). Wider predicted confidence intervals for combined donor averages provided more conservative estimates of life expectancy and maximum life span. The maximum life span was predicted as 636 and 702 d, and the average life expectancy of a day 62 PC was predicted as 287 and 320 d, using total or CD138+ cell numbers, respectively. The long-lived PC pool could either reflect the survival of a polyclonal set of PC precursors or represent an oligoclonal selection, with a distinct survival advantage for a limited number of PC precursors. To address this, we assessed expressed IGHV rearrangements in day 62 PCs. A wide range of functional rearrangements were expressed representing multiple IGHV families, with diverse joining (Ig heavy joining group [IGHJ]) and diversity group partners (Fig. 6A and data not shown). Although we cannot be certain that all functional rearrangements were detected, the observed ratio of unique IGHV rearrangements to PCs was in the region of 1:4 to 1:20 (212 unique sequences from 900 PCs in one donor and 104 unique sequences from 2000 PCs in the other), indicating that PCs at day 62 were broadly polyclonal. Long-lived PCs are polyclonal and mostly express mutated IGHV genes. Expressed IGHV genes, assessed in mRNA of day 62 PCs derived from two donors, identified 212 (donor A) and 104 (donor B) unique functional rearrangements. (A) The distribution of IGHV and IGHJ gene segments is shown for all unique functional rearrangements for donor A. IGHJ segments are indicated by gradation of shade from light to dark; IGHJ1 = white, IGHJ6 = black. (B) Mutational status of unique functional IGHV rearrangements is shown as indicated on the graph for donor A (dark gray) and donor B (light gray), where mutated status is defined as a sequence of <98% identity to germline sequence (% rearrangements on y-axis). (C) Average ratio of R/S (replacement/silent) nucleotide changes (plus SD) across the IGHV region, shown for three framework (FR) and two CDRs. Donor A is dark gray (upper panel); donor B is light gray (lower panel). Although PCs were derived from polyclonal activation of total peripheral blood B cells including both naive and memory fractions, 93% of the expressed functional IGHV rearrangements in day 62 PCs showed evidence of somatic hypermutation (Fig. 6B). Averaged across the population of rearranged IGHV genes, a higher replacement to silent mutation ratio was observed in CDRs relative to framework regions, with a replacement/silent ratio ≤2 in framework regions (Fig. 6C). Thus, PCs at day 62 derived from a population of B cells that had undergone somatic hypermutation with an overall pattern of mutations associated with selection for functional Ag receptors, in keeping with preferential survival of memory B cell progeny. To examine differentiation in more detail, we performed gene expression profiling at multiple time points across the system. To simplify direct comparisons between the final three time points (days 13, 20, and 41), we focused on flow cytometrically sorted CD138+ populations. Phenotypic differentiation was verified (data not shown) and followed the expected patterns as previously defined (Figs. 2, 5). To assess the dynamics of gene regulation, we defined clusters of genes with similar temporal patterns of regulation among the most variable genes across the series (days 0–41; 3200 probes/2750 genes). Although optimum cluster stability was obtained with >200 clusters (data not shown), for simplicity, we defined 50 clusters (Supplemental Table I), which show a median size of 66 genes and median stability of 97.4% (% of genes that consistently cocluster on iterative assessments). Hierarchical clustering was used to establish the interrelationships between these differentiation clusters, and emphasized recurring general patterns of gene regulation (Fig. 7). Long-lived in vitro PCs are reprogrammed for secretory activity and share a core gene expression pattern with bone marrow PCs. RNA from B cells and PCs was isolated at days 0, 3, 6, 13, 21, and 41. For the latter three time points, CD138+ cells were flow cytometrically sorted. Expression was assessed on Illumina HumanHT-12 v4 arrays. The 3200 most variable probes encompassing 2750 genes were used in K-means clustering with 6 principle components to generate 50 clusters of genes with similar patterns of expression. The relationship between clusters was assessed by hierarchical clustering of median expression values of each cluster at each time point. In the resulting heat map, cluster expression values are shown as Z scores (−2 to +2), as indicated above the heat map. Z scores derive from median expression values of each cluster across the differentiation series. Absolute levels of expression are provided in Supplemental Fig. 2. Samples are shown from left to right as indicated (one day 20 sample failed quality control and was excluded). Broad categories (B cell [B], activated B cell [ABC], plasmablast [PB], PC) were assigned according to heat-map distribution. The expression of cluster genes in bone marrow PCs is shown to the right. GO enrichment was assessed for each cluster, and a representative ontology term is indicated. The biological significance of clusters was assessed by analysis of GO enrichment. Ninety percent of clusters were associated with at least one significantly enriched GO term (false discovery rate [FDR] corrected p < 0.05) linked to two or more cluster genes. In most instances, there were multiple significantly enriched GO terms (Supplemental Table II). As expected, clusters initially repressed during differentiation were enriched for genes linked with Ag receptor signaling, lymphocyte activation, and plasma membrane components. Clusters expressed in resting B cells and induced in activated B cells were enriched for genes involved in translation elongation, RNA splicing, and de novo protein folding. Clusters induced in activated B cells that were not expressed in resting B cells were very strongly associated with cell-cycle (FDR corrected p value 3.58 × 10−38) and mitotic cell-cycle (4.77 × 10−29) terms. These clusters were expressed at lower level in day 6 plasmablasts and were silenced in PCs. Clusters induced specifically in PCs were associated with the endoplasmic reticulum (ER) and Golgi compartments, protein modification, and nucleosome assembly. The specific impact of culture conditions on PCs was evident in clusters 20 and 35, which were enriched for type I IFN-mediated signaling pathway components and targets. Clusters induced in plasmablasts and sustained in PCs included the majority of genes associated with the unfolded protein response (UPR) and ER structural components. In contrast, clusters induced in activated B cells and maintained throughout subsequent differentiation were enriched for genes linked to amino acid metabolic processes, electron transport chain, and response to zinc ions. The major transitions in gene expression followed the phenotypic changes observed by flow cytometry and transitions in culture conditions. The primary shift in gene expression associated with maturation of plasmablasts to PCs occurred between days 6 and 13. PC maintenance with prolonged culture was associated with limited changes in global gene expression, which was not surprising given that the culture conditions remained generally the same. However, several genes associated with long-lived PCs including SDC1, PRDM1, MCL1, BCL2, BCL2L1 (BCLX), BMI1, and BMP6 showed gradual increases in expression after day 13 (Fig. 8A–D, Supplemental Table II) (16, 43–45). Thus, regulators of PC fate do show progressive changes in expression accompanying extended life span, and this includes members of the BCL2 antiapoptotic family. Genes associated with long-lived PCs increased in expression under stable culture conditions. Real-time PCR for PRDM1 (A), BMI1 (B), MCL1 (C), and BCL2 (D) performed on the same samples used to generate the gene expression profile, from day 6 plasmablasts, and CD138+ day 13 and 41 PCs. The results validated the gene expression profile and highlighted a subset of genes whose expression was progressively increased during terminal differentiation. Significances shown were derived from a paired one-tailed t test. We next assessed the relationship between in vitro–generated and primary human bone marrow PCs at the level of expression profile. We sorted PCs from bone marrow samples, determined to have phenotypically normal PCs by flow cytometry (data not shown). We isolated PCs from 13 donors; 3 were analyzed as individual samples and 10 as a mixed pool. To assess the relationship between bone marrow PCs and the differentiation series, we compared the expression profiles of differentiation clusters by appending the gene expression values of bone marrow PCs to the clusters defined in the differentiation series (Fig. 7, Supplemental Fig. 2). For the majority of temporal differentiation clusters, bone marrow PCs showed similar levels of expression to long-lived in vitro–generated PCs; thus, secretory clusters were strongly expressed, whereas B cell, activated B cell, and plasmablast clusters were equivalently repressed in bone marrow and in vitro–derived PCs. Gene expression profiles from bone marrow PCs were associated with stronger but heterogenous expression of clusters that were downregulated after B cell activation and variably re-expressed in later phases of in vitro PC differentiation (clusters 15, 28, 31, 33, 34, 40, and 48). In contrast, clusters of genes associated with amino acid metabolism, electron transport chain, and response to metal ions (clusters 19, 30, and 36) were more strongly expressed among in vitro–derived PCs, although it should be noted that these are clusters of genes with modest dynamic ranges and retain significant absolute expression levels in bone marrow PCs (compare Fig. 7 with Supplemental Fig. 2). Because survival is linked to repression of apoptosis, we additionally considered the proapoptotic and antiapoptotic members of the BCL2 family independently (Supplemental Table I, cluster = BCL2 family). Of 17 genes assessed with 32 probes, only a single gene, BCL2L1, was differentially expressed (>2-fold FDR corrected p value < 0.05) and was higher among in vitro PCs. Notably, the principle antiapoptotic family member of bone marrow PCs, MCL1, was equivalently expressed. In direct comparison between bone marrow PC profiles and day 41 PCs, 284 protein coding genes (323 probes) were >2-fold higher in bone marrow PC profiles, whereas 245 genes (299 probes) were >2-fold lower (FDR corrected p value < 0.05). Of genes with greater expression in bone marrow PCs, 133 (149 probes) belonged to differentiation clusters (Supplemental Table I). 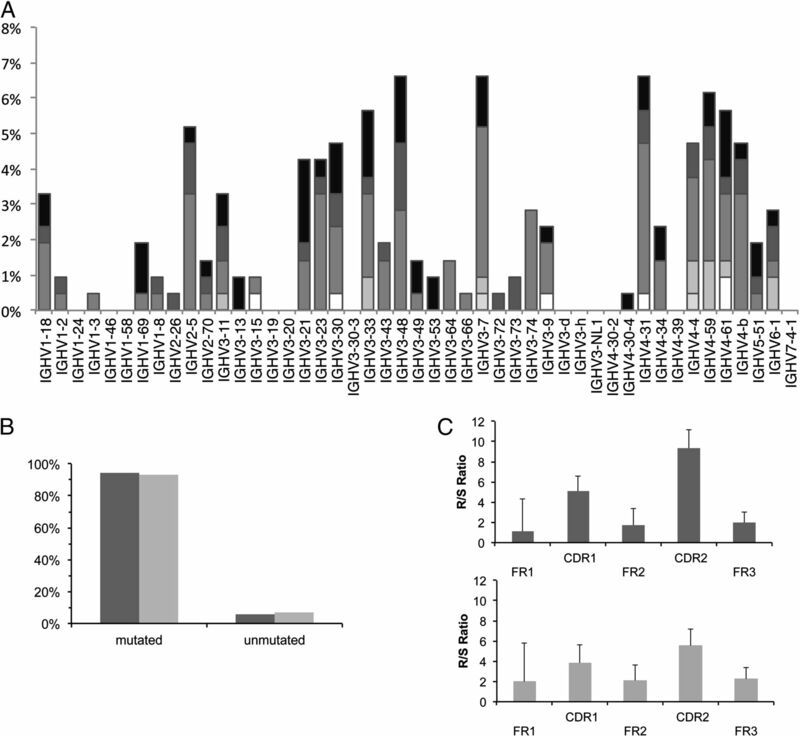 The 151 genes that did not were most significantly associated with GO terms related to nucleosome assembly (FDR corrected p value < 3.5 × 10−12) arising from histone variant genes, but were also associated with terms such as defense responses to fungi and bacteria, and oxygen transport (FDR corrected p value < 3.7 × 10−3), which likely derive from contaminating populations in the flow-sorted samples (data not shown). For genes with greater expression in day 41 PCs, 150 belonged to differentiation clusters (184 probes), whereas the 95 genes that did not lacked significant GO term associations. Among differentiation clusters, genes with greater expression in bone marrow PC profiles were more commonly associated with earlier stages of the differentiation, whereas genes overexpressed in day 41 PCs were more commonly associated with clusters expressed late during differentiation (Supplemental Table I). Thus, direct comparison highlights differences relating to the distinct nature and complexity of the in vivo and in vitro environments from which the PCs were derived. In contrast, the major groups of genes dynamically regulated during PC differentiation are similarly expressed between PCs of both origins, confirming that these cells share core gene expression profiles, as well as predicted extended life spans. To confirm that PC function paralleled the secretory gene expression profile, we tested the Ig content of supernatants removed at each feed. Feeding was performed with a 50% media exchange; thus, in the absence of Ig secretion, concentrations should decline by serial 2-fold dilutions across the culture. IgM and IgG displayed contrasting patterns with IgM declining rapidly toward zero, whereas IgG levels declined slowly toward a plateau phase (Fig. 9A). To assess secretion rates, we divided the amount of IgG secreted in the 3.5 d before each population assessment by the population number at the assessment. The average IgG secretion rate per cell reached a peak at day 20 of around 150 pg/cell/day and then reverted to a slightly lower plateau phase with an average IgG secretion rate of around 120 pg/cell/day. In contrast, IgM secretion rates did not reach a plateau and declined from a peak of 220 pg/cell/day at day 20 to 21 pg/cell/day at day 62 (Fig. 9B). Thus, surviving PCs show no loss of functionality over time, but in vivo long-term survival is heavily biased toward IgG-secreting PCs. Long-lived PCs have adapted to secretory burden. (A) At each feed of the long-term culture, a 50% media exchange takes place; removed media from each donor was tested for IgM (upper panel) and IgG (lower panel) by ELISA. Data are shown with each of four donors indicated by a distinct symbol. (B) Average per cell secretion rates were determined for each point of flow cytometric population assessment by dividing the amounts of IgM and IgG secreted in the 3.5 d before the population assessment (secreted Ig = Ig(timepoint) − Ig(timepoint-1)/2) by the total cell number at the assessment. Each donor is indicated by the appropriate symbol with the accompanying average trend line. (C) The status of XBP1 mRNA in untreated and DTT-treated PCs at day 62 was determined by RT-PCR. DTT-treated U937 cells acted as a positive control. Bands for unspliced and spliced XBP1 mRNA are indicated. Differentiation clusters that are induced in plasmablasts and show retained expression in PCs were enriched for genes linked to the UPR and ER/nuclear signaling (e.g., clusters 6 and 43). The transcription factor XBP1 is integral to normal PC differentiation, linking the process to ER stress and adaptation to secretory load (46). During the UPR, XBP1 mRNA is subject to an editing event in which a 26-nt sequence is excised (47, 48). Successful adaptation to secretory burden is anticipated to lead to resolution of ER stress when differentiation is complete. The sustained secretory activity and expression profiles thus led us to investigate whether there was evidence of persistent ER stress and an ongoing UPR in the mature PC population. We addressed this by examining the status of XBP1 mRNA in day 62 PCs. Consistent with successful adaptation to secretory burden, we found that spliced XBP1 mRNA was essentially undetectable in mature PCs at day 62. However, these cells retained the ability to splice XBP1 mRNA when treated with the reducing agent, and classical ER stress inducer, DTT (Fig. 9C). Thus, PCs at day 62 show little evidence of persistent ER stress in the steady state and are adapted to their secretory burden with sustained expression of multiple secretory pathway genes. The cells, however, remain capable of acutely activating this energy-dependent stress response pathway and processing XBP1 mRNA when challenged. In this article, we have shown that in vitro–generated plasmablasts are capable of generating long-lived PCs. These long-lived in vitro PCs and bone marrow PCs share a common pattern of expression of the majority of genes dynamically regulated during terminal B cell differentiation, the level of expression of CD138, preferential origin from memory B cells, and sustained IgG secretion. Although direct evidence of extended longevity for human PCs in vivo is lacking (1), serological studies indicate that human PCs may persist for decades (3), and the persistence of PCs after B cell depletion has been confirmed in mouse and human (1, 5, 49). Murine PCs can survive without dividing for >90 d, and estimates of their half-lives range from 100 to 400 d (10, 11, 50). It is likely that long-lived human PCs have at least equivalent life spans in vivo, significantly greater than any previous recorded capacity of in vitro–generated PC survival (20, 24, 25). In contrast, in our system, PCs survive as postmitotic cells and were limited only by elective culture termination. The conservative estimates of PC life expectancy of around 300 d are equivalent to directly documented PC life spans (10, 11). In this system, only a fraction of plasmablasts generates long-lived PCs, recapitulating a common feature of immune responses: PCs contributing to immunological memory emerge after contraction of larger populations of short-term effectors (6, 9, 45). Competitive occupancy of survival niches controls the entry of ASCs into the long-lived PC pool in vivo (1). However, other intrinsic differences are also likely to contribute to PC life span (50). Indeed, Ab titers to specific vaccines show consistent half-lives supporting determinants related to differentiation stimuli (3). The contraction in cell number observed when plasmablasts are provided with equal access to survival and maturation signals indicates that intrinsic differences determine PC life span in our model. These results, although not at odds with the concept of niche competition as a primary determinant of longevity in vivo, do indicate that differences in the ability to generate long-lived PCs are established as a cell intrinsic feature of ASCs, independent of the ability to migrate to and localize within a niche. Somatic hypermutation of IGHV genes indicates that long-lived in vitro PCs are preferentially derived from memory rather than naive B cells. Bone marrow PCs show similar biases in somatic hypermutation load (51). One explanation for this may lie in preferential homing of memory or GC B cell–derived ASCs to bone marrow niches. In our model, naive and memory B cells generate equivalent numbers of plasmablasts (data not shown); thus, selection is occurring after this stage. The failure of naive B cells to contribute equivalently to the long-lived PC pool indicates a difference in the ability to survive independent of niche homing. This might be explained if naive B cell progeny have distinct survival requirements, such as a greater dependence on a proliferation-induced ligand (APRIL), which appears to be a weak or absent signal in our system. The loss of naive B cell–derived PCs correlates with loss of IgM secretion over time. Adaptation to secretory load is essential for PC differentiation, and secretory stress contributes to cell death in ASCs (12–14, 46). In the context of such a model, secretion of IgM may drive greater stress (14), because of the more stringent requirements for assembly of pentameric complexes (52). This, in turn, could explain the poor survival of the majority of naive B cell–derived PCs and predicts that class-switched progeny of naive B cells would have more similar survival to their memory B cell counterparts. If naive B cell–derived ASCs are programmed for a short life span independent of class-switching, this would imply the existence of a heritable determinant of life span related to germinal center transit as a mechanism contributing to licensing of the long-lived PC pool. In the context of the secretory model of PC survival, it has been suggested that a feature of bone marrow “memory” PCs is the ability to balance ER stress, dependent on interaction with the PC niche (1). Consistent with this model, stable rates of Ig secretion are maintained by long-lived in vitro PCs that retain the ability to undergo an efficient UPR but are not experiencing sufficient intrinsic ER stress to splice XBP1 mRNA. These PCs have thus established a balance between secretory burden and capacity, which correlates with the complete reprogramming to a secretory expression profile similar to that of bone marrow PCs. Direct assessment of individual ASC secretion rates has demonstrated subpopulations of high and low IgG secretors among in vitro differentiating human B cells (53). The average per cell secretion rate of 120 pg/cell/day that we observe during the plateau phase of the culture falls toward the upper end of the high secretor range. The plateau of secretory activity at a high but submaximal level, in the absence of significant XBP1 mRNA splicing, supports a model of selection for secretory fitness (14). During development of this system, we explored a range of different conditions. The initial phases of the culture are related to those used in previous studies (21, 36), but optimized for cell number and homogeneity of phenotype. Inclusion of BCR stimulation enhanced day 6 cell number and promoted CD38 acquisition but was not essential to allow emergence of mature PCs at later time points (data not shown). At the beginning of our studies, Jourdan et al. (20) published that IL-6 and IFN-α could promote the short-term maturation of plasmablasts to PCs but terminated at day 10 of culture, and thus did not address a role in sustaining PC longevity. It had previously been reported that IL-6 and IFN-α secreted by plasmacytoid dendritic cells promotes B cell terminal differentiation (23), providing a biologic context for this combination of stimuli. A range of other cytokines reported to support ASC survival was tested, including recombinant SDF1, TNF-α, APRIL, B cell–activating factor, and hyaluronic acid (24, 54, 55). None enhanced recovery of PCs over that observed with IL-6, IFN-α, and M2-10B4 cells (data not shown). Of these primary components in the maturation phase of the culture, each contributes to PC viability. Removal of any one component reduces the recovered cell numbers by ≥50%, although at time points up to day 20 PCs remain recoverable (data not shown). Although we cannot assign a dominant role to any of these three components, it is evident from the gene expression profiles that IFN-α induces sustained signaling. Although the type I IFN signal is greater among in vitro–generated PCs than bone marrow PCs, it is nonetheless the case that bone marrow PCs show stronger expression of these genes than is observed among plasmablasts, suggesting that a type I IFN signal is operating in the context of the bone marrow PC niche. The mechanism by which M2-10B4 cells contribute to PC survival remains to be established, but dependence on a soluble factor is shared with hemopoietic stem cell cultures (56). Although it was beyond the scope of this study to define all secreted components and how they impact on PCs, we have generated an initial assessment of the M2-10B4 secretome; this remains consistent with its bone marrow stromal derivation. Of particular relevance are LGALS1 (Galectin-1), previously linked to PC generation and survival (57), and SPP1 (osteopontin), which is involved with IL-6 in myeloma, and has a role in the hemopoietic stem cell niche (58–60), which overlaps with the physiologic PC niche (38). Several other cell types have been implicated in PC survival, many through secretion of APRIL (4, 61). Some, such as neutrophils and eosinophils (62, 63), are difficult to test in long-term in vitro cultures because they have significantly shorter life spans than the cultured PCs and release toxic granules. Others such as osteoclasts act through contact-dependent mechanisms (25). Although each of these cell types may also be capable of supporting long-term PC survival, for practical applications, there is a great benefit in using a stromal cell line such as M2-10B4, which mediates its effects in a contact-independent fashion. As a secreted factor and an element of the in vivo PC niche, APRIL was a likely candidate for the stromal signal (64, 65). However, TACI-Ig of either human or mouse origin (inhibitors of both APRIL and B cell–activating factor), at concentrations (50 ng/ml to 5 μg/ml) equivalent to those observed with intense treatment schedules in human, had no reproducible effect on PCs up to day 20 in our system (data not shown). These results may relate to the clinical setting, where IgG titers are more resistant than IgM or IgA to TACI-Ig fusion protein treatment, and certain autoantibodies and vaccine-related immunity derived from long-lived PCs (3, 5) are not significantly affected (66, 67). Gene expression profiles provide support for the lack of APRIL signaling in our model. Although the primary APRIL receptor on PCs, TNFRSF17 (BCMA) (68), was expressed at an equivalent level among in vitro PCs to that observed in bone marrow PCs, NF-κB target genes such as TNFAIP3 and NFKBIA were expressed at significantly lower levels. To our knowledge, our data provide the first complete longitudinal tracking of a terminally differentiating human B cell population including long-lived PCs and builds on previous analyses of the initial phases of PC differentiation (16, 20, 40). Our focus on clusters of dynamically coregulated genes underlines the overall similarity between bone marrow and in vitro PCs, and provides a coherent view of progressive genetic reprogramming to a complete secretory phenotype. Interestingly, the gradual maturation to CD138high surface expression was reflected in the profiles of only a subset of genes such as PRDM1, MCL1, BCL2, and BMI1. In contrast, the majority of gene expression changes were more rapid after the major transitions in culture conditions. Populations with “transitional” CD138low phenotypes are evident in the peripheral blood, and a few can be observed in bone marrow (7, 17). However, the kinetics of transition between CD138low and CD138high in vivo is not known and may be more rapid. Indeed, inclusion of additional components such as an enhanced NF-κB signal may accelerate expression changes in vitro. In conclusion, we have identified a set of conditions that recapitulate the essential in vivo function of the PC niche, maintaining a long-lived and phenotypically distinct PC population. This model system provides a tool with which to address a number of critical questions relating to PC biology in health and disease. We thank Sean Diehl for providing CD40L transfected L cells and Connie Eaves for providing M2-10B4 cells. We thank Ruth De Tute for flow cytometry advice, Paul Evans for assistance with ROCHE 454 sequencing, Sharon Barrans and Lisa Worrillow for assistance with gene expression profiling, and Dennis McGonagle for critical review of the manuscript. We thank John Sinfield for assistance with long-term cell cultures and ELISA. This work was supported by Leukaemia and Lymphoma Research Grant 07/001 (to S.S. and R.M.T.) and Cancer Research United Kingdom Senior Clinical Fellowship Grant C7845/A10066 (to M.C., M.A.C., and R.M.T.).
. 2010. Memory B and memory plasma cells. Immunol. Rev. 237: 117–139.
. 2010. Plasma cell development and survival. Immunol. Rev. 237: 140–159.
. 2010. Mechanisms that determine plasma cell lifespan and the duration of humoral immunity. Immunol. Rev. 236: 125–138.
. 2011. Long-lived autoreactive plasma cells drive persistent autoimmune inflammation. Nat Rev Rheumatol 7: 170–178.
. 2006. Immunization-induced perturbation of human blood plasma cell pool: progressive maturation, IL-6 responsiveness, and high PRDI-BF1/BLIMP1 expression are critical distinctions between antigen-specific and nonspecific plasma cells. J. Immunol. 176: 4042–4050.
. 2006. Understanding and making use of human memory B cells. Immunol. Rev. 211: 303–309.
. 2000. Intrinsic constraint on plasmablast growth and extrinsic limits of plasma cell survival. J. Exp. Med. 192: 813–821.
. 2006. The endoplasmic reticulum is a key component of the plasma cell death pathway. J. Immunol. 176: 1340–1347.
. 2010. The life span of short-lived plasma cells is partly determined by a block on activation of apoptotic caspases acting in combination with endoplasmic reticulum stress. Blood 116: 3445–3455.
. 2007. Managing and exploiting stress in the antibody factory. FEBS Lett. 581: 3652–3657.
. 2004. Divide and conquer: the importance of cell division in regulating B-cell responses. Immunology 112: 509–520.
. 2003. Gene expression profiling of plasma cells and plasmablasts: toward a better understanding of the late stages of B-cell differentiation. Blood 102: 592–600.
. 1999. Reactive plasmacytoses are expansions of plasmablasts retaining the capacity to differentiate into plasma cells. Blood 94: 701–712.
. 2002. CDK inhibitor p18(INK4c) is required for the generation of functional plasma cells. Immunity 17: 179–189.
. 1995. Generation of memory B cells and plasma cells in vitro. Science 268: 720–722.
. 2002. The role of bone marrow-derived stromal cells in the maintenance of plasma cell longevity. J. Immunol. 169: 4213–4221.
. 2007. 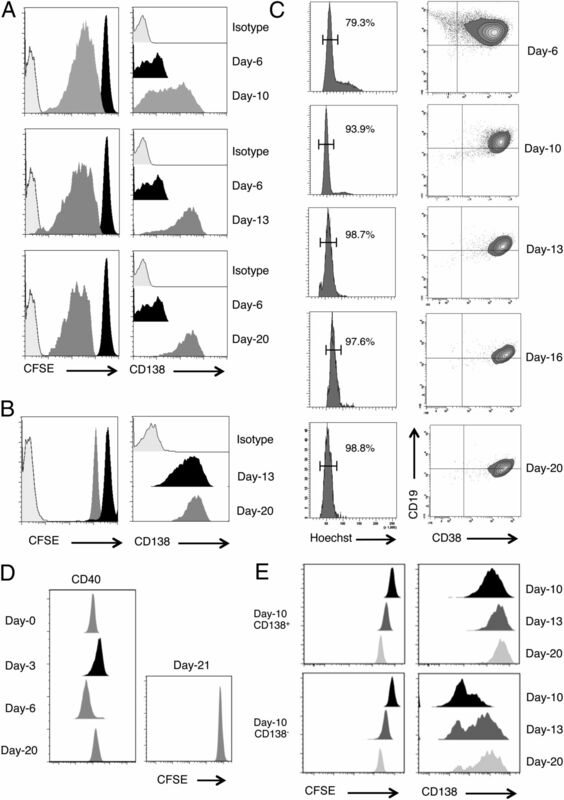 CpG DNA activation and plasma-cell differentiation of CD27- naive human B cells. Blood 109: 1611–1619.
. 2008. Osteoclasts support the survival of human plasma cells in vitro. Int. Immunol. 20: 775–782. van Dongen, J. J., A. W. Langerak, M. Brüggemann, P. A. Evans, M. Hummel, F. L. Lavender, E. Delabesse, F. Davi, E. Schuuring, R. García-Sanz, et al. 2003. Design and standardization of PCR primers and protocols for detection of clonal immunoglobulin and T-cell receptor gene recombinations in suspect lymphoproliferations: report of the BIOMED-2 Concerted Action BMH4-CT98-3936. Leukemia 17: 2257–2317.
. 2008. IMGT/V-QUEST: the highly customized and integrated system for IG and TR standardized V-J and V-D-J sequence analysis. Nucleic Acids Res. 36(Web Server issue): W503–W508.
. 2006. BLIMP-1 is a target of cellular stress and downstream of the unfolded protein response. Eur. J. Immunol. 36: 1572–1582. 2008. adegenet: a R package for the multivariate analysis of genetic markers. Bioinformatics 24: 1403–1405. 2009. Ggplot2: Elegant Graphics for Data Analysis. Springer, New York.
. 2005. BiNGO: a Cytoscape plugin to assess overrepresentation of gene ontology categories in biological networks. Bioinformatics 21: 3448–3449.
. 2002. The heterogeneity shown by human plasma cells from tonsil, blood, and bone marrow reveals graded stages of increasing maturity, but local profiles of adhesion molecule expression. Blood 99: 2154–2161.
. 2004. Cellular niches controlling B lymphocyte behavior within bone marrow during development. Immunity 20: 707–718.
. 1988. Partial characterization of a novel stromal cell-derived pre-B-cell growth factor active on normal and immortalized pre-B cells. Exp. Hematol. 16: 718–726.
. 2011. Characterization of a transitional preplasmablast population in the process of human B cell to plasma cell differentiation. J. Immunol. 187: 3931–3941.
. 1996. B cell differentiation and isotype switching is related to division cycle number. J. Exp. Med. 184: 277–281.
. 1994. Expression of CD28 and CD40 in human myeloma cells: a comparative study with normal plasma cells. Blood 84: 2597–2603.
. 2009. Bone morphogenic protein 6: a member of a novel class of prognostic factors expressed by normal and malignant plasma cells inhibiting proliferation and angiogenesis. Oncogene 28: 3866–3879.
. 2006. Microarray-based understanding of normal and malignant plasma cells. Immunol. Rev. 210: 86–104.
. 2003. Plasma cell differentiation and the unfolded protein response intersect at the transcription factor XBP-1. Nat. Immunol. 4: 321–329.
. 2002. IRE1 couples endoplasmic reticulum load to secretory capacity by processing the XBP-1 mRNA. Nature 415: 92–96.
. 2001. XBP1 mRNA is induced by ATF6 and spliced by IRE1 in response to ER stress to produce a highly active transcription factor. Cell 107: 881–891.
. 2011. Sustained antibody responses depend on CD28 function in bone marrow-resident plasma cells. J. Exp. Med. 208: 1435–1446.
. 2011. Differential regulation of self-reactivity discriminates between IgG+ human circulating memory B cells and bone marrow plasma cells. Proc. Natl. Acad. Sci. USA 108: 18044–18048.
. 2007. Sequential steps and checkpoints in the early exocytic compartment during secretory IgM biogenesis. EMBO J. 26: 4177–4188.
. 2009. Modulation of single-cell IgG secretion frequency and rates in human memory B cells by CpG DNA, CD40L, IL-21, and cell division. J. Immunol. 183: 3177–3187.
. 2003. Plasma cell survival is mediated by synergistic effects of cytokines and adhesion-dependent signals. J. Immunol. 171: 1684–1690.
. 2003. BAFF selectively enhances the survival of plasmablasts generated from human memory B cells. J. Clin. Invest. 112: 286–297.
. 1996. Stromal fibroblast heparan sulfate is required for cytokine-mediated ex vivo maintenance of human long-term culture-initiating cells. Blood 87: 3229–3236.
. 2008. Galectin-1 promotes immunoglobulin production during plasma cell differentiation. J. Immunol. 181: 4570–4579.
. 2004. Osteoclasts enhance myeloma cell growth and survival via cell-cell contact: a vicious cycle between bone destruction and myeloma expansion. Blood 104: 2484–2491.
. 2005. Osteopontin is a hematopoietic stem cell niche component that negatively regulates stem cell pool size. J. Exp. Med. 201: 1781–1791.
. 2005. Osteopontin, a key component of the hematopoietic stem cell niche and regulator of primitive hematopoietic progenitor cells. Blood 106: 1232–1239.
. 2012. Homing and adhesion patterns determine the cellular composition of the bone marrow plasma cell niche. J. Immunol. 188: 1283–1291.
. 2011. Eosinophils are required for the maintenance of plasma cells in the bone marrow. Nat. Immunol. 12: 151–159.
. 2008. Cutting edge: the dependence of plasma cells and independence of memory B cells on BAFF and APRIL. J. Immunol. 180: 3655–3659.
. 2008. APRIL is critical for plasmablast survival in the bone marrow and poorly expressed by early-life bone marrow stromal cells. Blood 111: 2755–2764.
. 2011. Atacicept in patients with rheumatoid arthritis and an inadequate response to tumor necrosis factor antagonist therapy: results of a phase II trial, randomized, placebo-controlled, dose-finding trial. Arthritis Rheum. 63: 1793–1803.
. 2011. Atacicept in patients with rheumatoid arthritis and an inadequate response to methotrexate: results of a phase II, randomized, placebo-controlled trial. Arthritis Rheum. 63: 1782–1792.
. 2004. BCMA is essential for the survival of long-lived bone marrow plasma cells. J. Exp. Med. 199: 91–98.